A front, forecast throughout yesterday's weather reports, rolled in late evening. Rain, sometimes very heavy rain, came just as I put the boom tent in place. I fell asleep listening to football on the radio played to the rhythm of raindrops on the tent. Up at 6:25, grey skies visible out the back end of the boom tent. Poking my head out of the tent I find patches of blue. The north wind whistles through the trees. 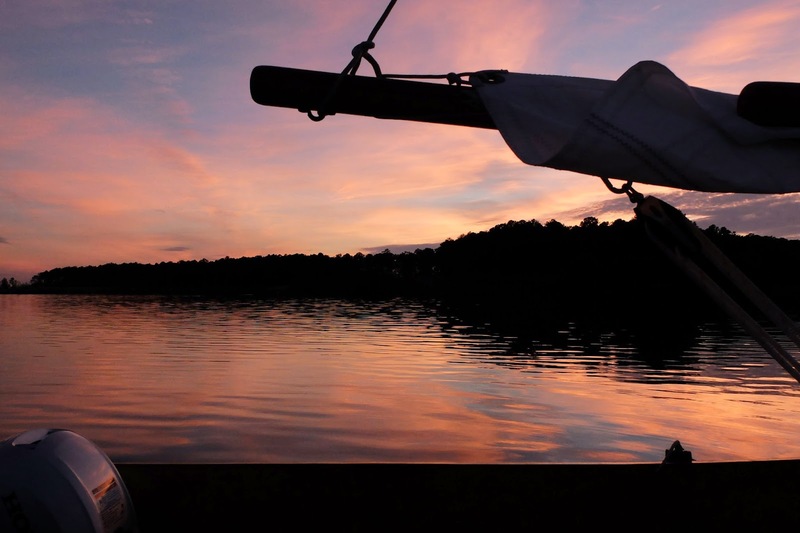 We sail off anchor under mizzen and jib, sunshine peeking through the trees on the east side of our anchorage. 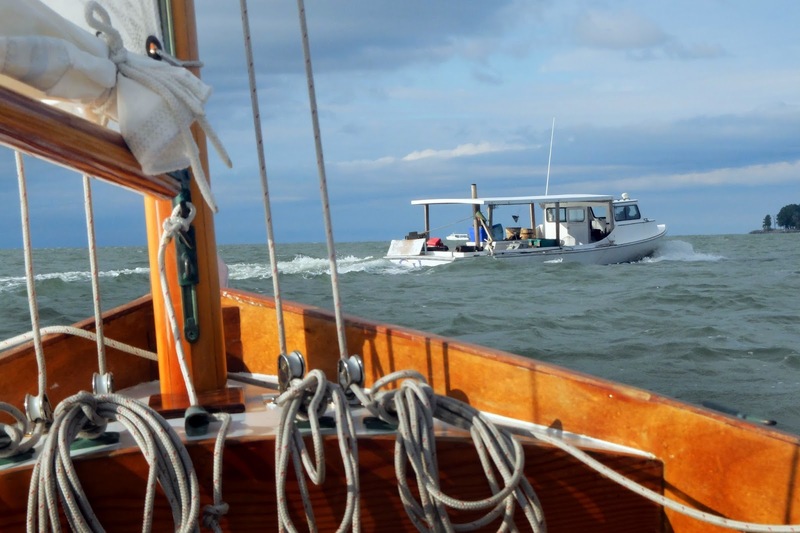 Rounding up at the mouth of Leadenham Creek, I raise a double-reefed main to carry us out on to Broad Creek. Working the halyards I can feel warm sunshine on my back. We are on the Choptank River at 8:35, heavy dark clouds lingering below blue skies. A deadrise cuts across our bow. 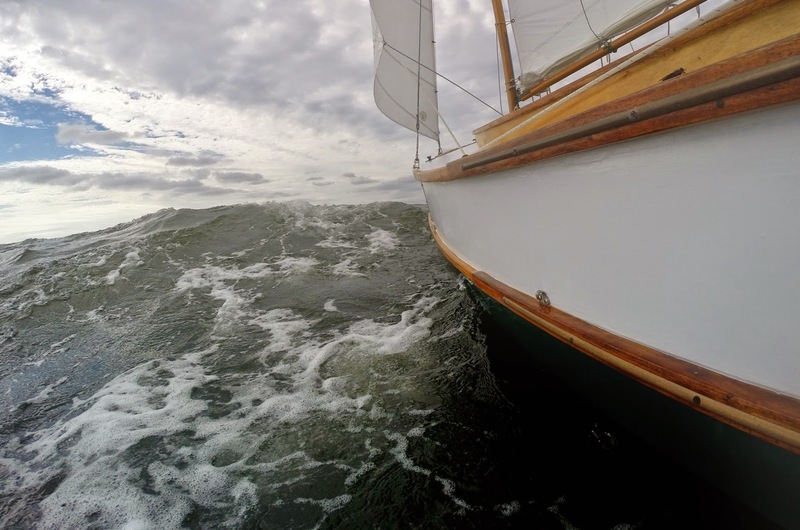 We make 4.5 to 6 knots surfing down the face of waves pushed across the Choptank by the strong north wind. 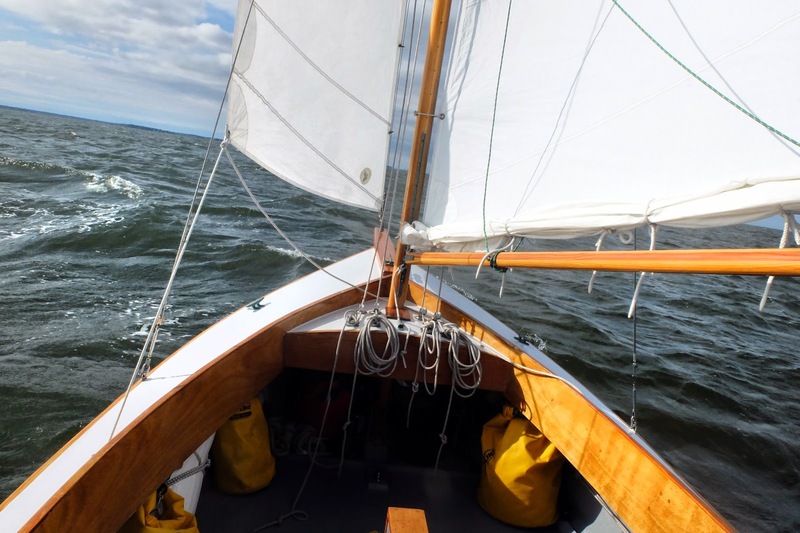 The biggest waves come on the starboard quarter, pushing Spartina sideways. I bring in the mizzen, which I had not really needed since leaving Leadenham Creek. 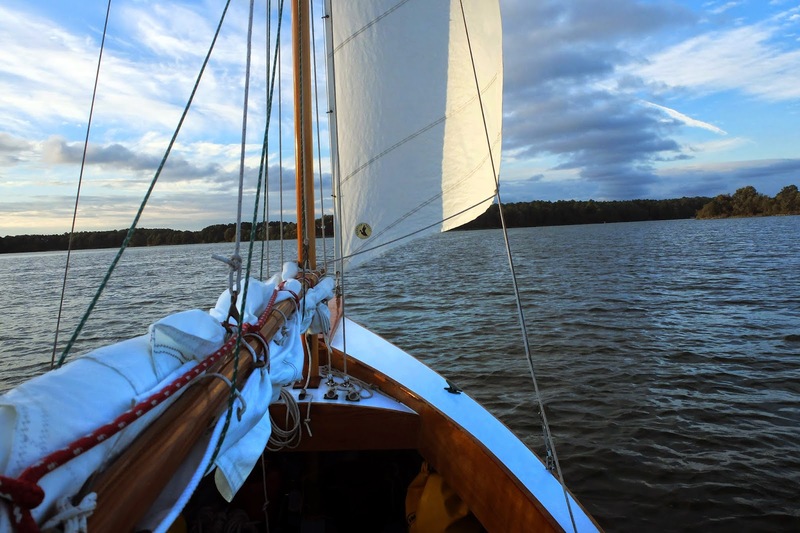 Wing and wing it is a wonderful ride on the rolling water. Approaching Cook Point sea gulls dart at a patch of boiling water. The gulls are after a school of baitfish chased up against the surface by larger fish from below. Sliding down waves on a downwind run, not the ideal situation for spot casting, but I grab the rod and quickly cast a golden spoon. I cast too quickly and catch the spoon in the mizzen halyard. I unhook it and make a second, more careful cast to the far side of the swirling water. Spartina rushes downwind, pulling the lure through the school and soon a fish is tugging at the line. 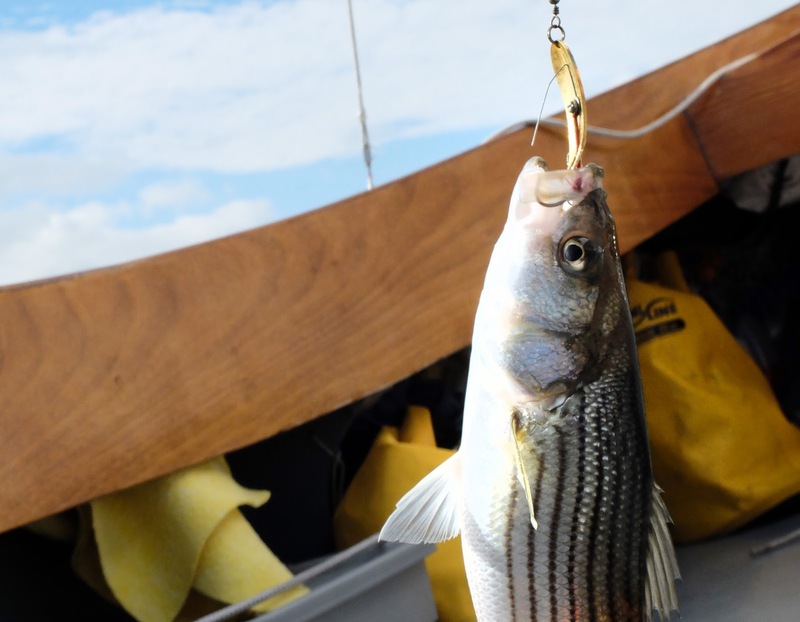 The striper puts up a fight, but it is more of a battle against the water reeling the fish in at five knots. I get small striper up to the boat, take a quick picture, grab the spoon and flip the fish over the side. 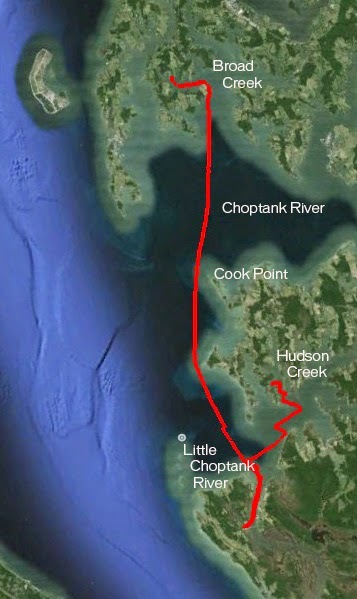 We pass Cook Point at six knots, then Hill Point sailing through a field of crab pots. The water calms on the Little Choptank and the wind begins to drop off. Late morning at the mouth of Slaughter Creek we are under full sail, both reefs taken out of the main and the mizzen raised once again. We tie up at Chapel Cove Marina on Taylor Island and grab a crab cake sandwich at the Island Grille. Business is slow. A woman has her 90-year-old father out for lunch, which he finishes with a cold glass of beer. Leaving Taylors Island we motor across the creek to the marine supply shop at Slaughter Creek Marina to get fuel and some drinks. Wind still out of the north, and grey skies. 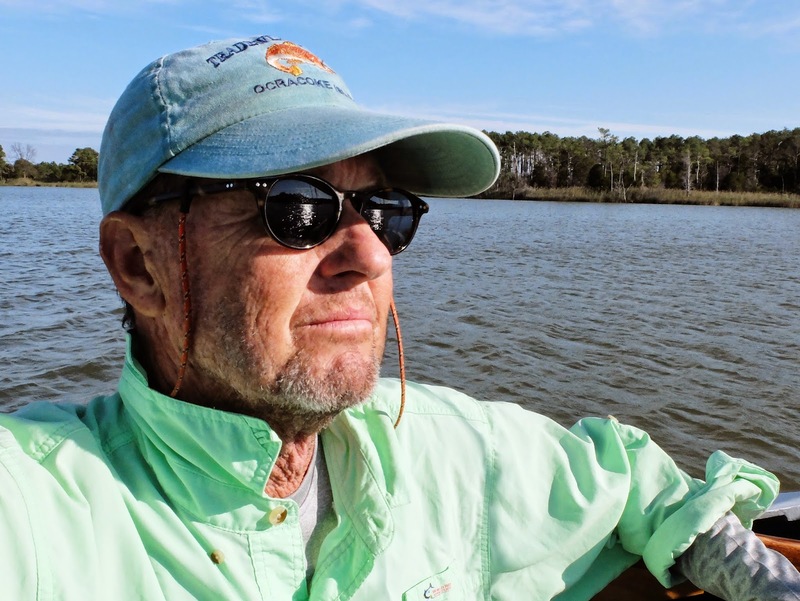 We motor north on Slaughter Creek, raising sail at the river entrance markers. 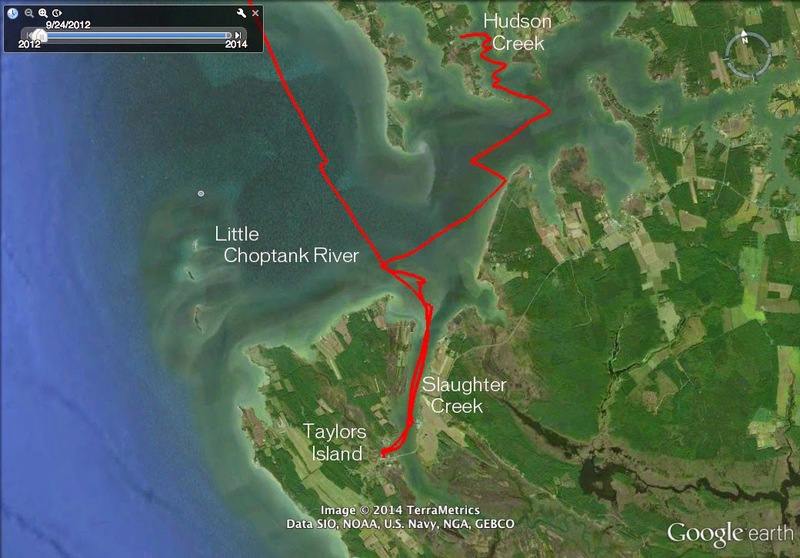 We make a series of tacks up the Little Choptank to clearing skies. Late afternoon we enter Hudson Creek, calm water and steady wind. We slip into a small cove on the west side of the creek. To the north is a dock with two deadrises, and to the southwest on the far side of a small point is another dock with two more deadrises. I suspect diesel engines will be my alarm clock come morning.